If you were a teenaged geek in the 80s, you were probably glued to the TV set every week for Tomorrow’s World. It was certainly unmissable viewing in our household. The idea that we might perhaps catch a glimpse of the future was tantalising, but not as tantalising as the fact that the show went out live and sometimes, well, things didn’t go according to plan. Kieran Prendiville in particular seem to suffer regular calamity. But the person I remember most clearly from those years was Maggie Philbin. She co-presented the show from 1985 until 1994. I was 14 when she started working on Tomorrow’s World and going through the ‘What do you want to be when you grow up?’ discussion quite regularly. My school careers advisor was no use: She just said “Well, Susan, you seem to be quite good at everything, so you can do whatever you like.” Right, well, that helps me narrow things down! 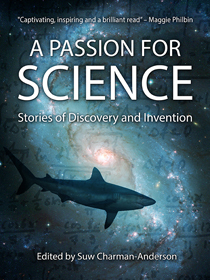 Yet there was no doubt in my mind that I was going to go into the sciences. I mean, why wouldn’t I? 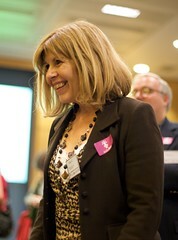 Maggie Philbin was up there, using technology live on TV and if she could do it, so could I! I would love to say I recognised their significance immediately but often the technology was fragile or incomplete – a mixture of space age and Stone Age – and the real potential was hidden. The fax machine, sat-nav, bar-code reader and digital cameras did all become commonplace, and all passed through Maggie’s hands (except the camera, which she had to ‘demonstrate’ without having the actual thing!). Of course, she also demoed the “the fishing rod that lit up in the dark, the washing line that sang when it rained and the electric blanket that knew where your hot bits were”, and we all know what commercial successes they were! When I was watching TV as a kid, I’m not sure that I realised how important it was for me to see women like Maggie Philbin and Judith Hann – another Tomorrow’s World presenter – demoing technology on TV. For them, talking about tech was second nature and in the Tomorrow’s World team they weren’t relegated to the soft and fluffy stories, but showed us real, proper inventions. I had never heard the word ‘geek’ back then, but if I had I would have recognised not only myself in that word but also these intelligent, articulate women whom I watched avidly each week. And really, this is what Ada Lovelace Day is about: creating role models for girls (and other women) around the world. I don’t think we have enough smart science and technology shows on TV at the moment. Whilst the BBC has produced some great programmes, there’s a distinct lack of female scientists and technologists on TV right now. Where are our own home-grown Maggie Philbins and Judith Hanns?